Confidence is something I believe everyone struggles with at one (or many) points in their life and career, especially during career changes. Speaking from experience, I was extremely nervous to take the plunge into the world of technology after spending multiple years in the art world, including a Bachelors of Fine Arts. Yes, I studied ceramics in school and now I've forged a new path toward software engineering (life is full of surprises). The concept of inclusion was highly talked about, which most often refers to inclusion within a network of people but I believe it applies within oneself as well. I come from a diverse family with my artist father and my programmer mother, so when Avis Yates Rivers said "bring your whole self to whatever you do", I could not relate more. I've found that many times our strengths aren't always the traditional skill set associated with a job or task. I believe the artist in me allows me to problem solve differently than others on my team and my overall confidence in my creative skills drives me to improve my technical skills. As an art student you put your art, and symbolically yourself, on a pedestal for critiquing which forces you to face your fears of failing. Once again as Rivers stated, you must leave your fears of how you will be interpreted and ‘bring yourself anyways'. With my background it will be no shock that I wholeheartedly believe in the importance of one's creative spirit. Many people believe creativity is only linked to being artistic or an artist but I've never believed these to be mutually inclusive. To me, creativity is about passion, innovation and curiosity, no matter the subject matter or skill. During Rivers' segment on ‘Necessary Inclusion', she speaks of the importance of individual experiences within innovation. Multiple people can be given the same task, product, or situation and each will execute, experience and react differently based on their personality and whole life experiences. This is how we all can continue to progress, especially in the world of technology. In conclusion of the conference, MC Ferrell made a vibrant declaration that "we have to be intentional about getting inspired" and we do! Sometimes that means taking a break from the old and trying something new or maybe returning to the familiar to boost our spirits before conquering a puzzling dilemma at work or home. The final element for success is connections. This is what I personally struggle with most, at least when I have to be intentional about it. I am a bubbly person socially but the world of networking is not a comfort zone for me and I know it is not for many. Some of the best advice I took from this conference is about making new connections. During a break-out session about "Building Your Personal Brand", one speaker said "you must cast a wide net" to capture people of interest and from there, you can start narrowing down your network. If you start out too exclusive in your search for connections, you are more likely to block yourself from opportunities. Again, this is easier said than done (for me at least). It takes a lot of courage and effort, but the number one part to nurturing your connections is communication. I cannot stress this enough - we are beings dependant on communication whether it's direct or inferred through verbal language, body language, social cues, etc. I think we all have to take care and time in communicating clearly, intentionally and often, and take into consideration that not everyone communicates in the same way as you. If nothing else, I urge you to put this conference on your calendar for next year. It has yet to fail at putting a pep in my step and motivating me to think, dream and ultimately take action. What's your Impact? Such a powerful question. It is something that certainly resonated with me as I enter the midpoint of my career in technology where I often wonder if the work I am doing is making a difference for anyone, anywhere. It's a question I think we all struggle with at some point either personally, professionally or both. What is our purpose? How are we perceived? How do our actions, words, projects, code, applications, social media posts, etc impact our network and beyond? This string of seemingly harmless words can often send the most confident career person into a downward spiral where they begin to question their value, impact, and self-worth. However, from observation, this conference seemed to have an opposite effect. As you sit in a room of successful women (and men) and begin to hear the rumblings that often occur when a speaker provokes this kind of thought you suddenly realize you aren't alone. Even the most successful career person has days where they struggle with their worldly footprint. I think it is often easy to forget that we all start out the same way. That each of us, no matter how successful or impactful, puts our pants on one leg at a time. We are all equal often stifled by our own comparison to others. The message; Your personal brand paves the way for the impact you leave behind, every post, every comment, every action determines your professional and personal footprint and each should be calculated and methodical in order to be successful. Right? Sounds perfect, let's get started... but how? What does the first step look like? What happens when you hit that inevitable setback or encounter that first devastating failure? How do you handle all the criticism and feedback and continue to show up each day putting your best foot forward? Better yet, if you are mid-career how do you morph an existing personal brand that you may have outgrown into the career person you are today? I can't answer all these questions simply from attending the Women in Tech conference but I can tell you that I listened to a slew of speakers, all women, all successful. Not a single one of them had an easy road, none of them fell into success or got where they are without dusting a little dirt off and rising to the occasion. Each speaker told a different story but they all carried a similar theme: be confident, know your worth, bring your whole self to the table, be utterly relentless in the pursuit of your passion, and always live your purpose. I won't sugar coat this, that last one... living my purpose. That has been stuck with me since I walked out of that beautiful, yet extremely not conference friendly, train station and went on about my life. One word, purpose. What is my purpose? I still don't have the answer and it's been a week, I know... an entire week and I haven't solved this tiny little problem, ridiculous! I think what's more interesting is that after spending many dollars, eating too many boxed lunches, sitting in too many uncomfortable chairs, listening to people talk at me year after year at conferences I am still thinking about what was said after a week. For a skeptic conference attendee like me - that is a first. Don't get me wrong, no conference is perfect. I am far too much a pessimist to walk away from any event without pointing out a few contradictions and lodging a few complaints. One of the biggest complaints for me was all the talk about social media. Love it or hate it we all use it (if you don't I respect and envy your peaceful lifestyle) and we know that it casts a large shadow on our image both personally and professionally, both good and bad. Here's the thing though that old adage of everything in moderation still holds true. When I look to social media to find a colleague or peer I don't want to see a squeaky clean profile, I'd rather see a person I can relate too. Someone with a messy life, someone who has overcome hardship, someone who knows the value of a dollar, has worked hard, loves their significant other, loves their pet (pet posts need love too), spends time outside of work and enjoys an occasional beer or a night out. Maybe it's just me but if you're blemish free you aren't authentic and genuine, to me you're hiding something. Go easy on me though, I already admitted I was a pessimistic skeptic. If you have not yet attended this conference, do yourself a favor and add it to your list for next year. Not only is it amazing to see so many women from all over the world come together in support of technology it is sobering to hear that despite all our success and triumphs we all still struggle with the fundamentals of being human. Looking at the lineup prior to buying tickets for this year's conference, I was a little nervous. These speakers didn't sound like they would be as IT-focused as those I'd heard from in the past. I was worried that after seven years of attendance I wouldn't be able to say rvatech/women had yet again outdone themselves. Boy was I wrong! We heard from astounding women with unique perspectives on how things are changing and adapting in the technology industry for not only gender differences but for diversity in general. Bringing Courtney Ferrell back again this year was the first step towards an amazing conference. She has such passion for everything she says. Early morning conferences can start at a bit of a drag but it was hard to even show an ounce of sleepiness with Courtney up on stage - brightening anything and everything in the room. "Be intentional about being inspired" was one of many favorite phrases from the day. I have said in the past that getting a degree in Business Information Systems made a world of difference in my career. Having that engineering background with a mix of business concepts and understanding has helped me maintain relationships with business leaders within every project I have been a part of. Hearing Kate Foster speak towards just this was perfect! IT and business people don't speak the same language, everyone knows that. But what few engineers learn early on is that you must be able to translate for the business. IT "gobbledygook" causes problems -- no matter how good your solution is. What good are innovative ideals if you can't explain why they're good. Ineffective communication is one of the primary contributions to project failures ⅓ of the time (and has a negative effect ½ of the time). And even if you know how to communicate, how do you know the message you're sending is what they're receiving? Get to know the client! And get to know yourself. Women hold a meaningful percentage of participation in the technology world. We comprise 57% of US professional occupations, 26% of US tech jobs and 19% of the US software developers. These numbers sound about right! We are growing in this industry and I feel a shift in the balances. But even with all that change and time we still only hold 5% of technology leadership jobs. Avis Rivers spoke to this idea; that the gaps in this industry aren't just about pay but also still with gender and race. Being aware of the problem, she described best as intersectionality, we can better acknowledge and ground the differences among us. We can break out of these discriminations and disadvantages. Step 1: "Bring your whole authentic self to work and what your doing". We're all different. Diversity of thought leads to better problem solving. But it's this combination that drives innovation! Engage all the voices on your team. Don't filter questions or solutions based on race or age. We need everyone represented in each business. Change the dynamic! Step 2: Understand that equality doesn't work for everyone. 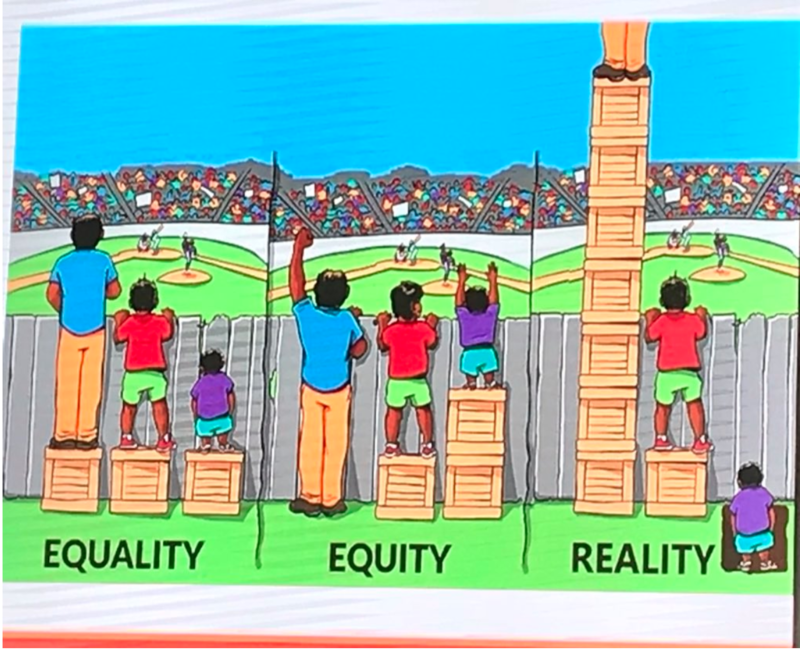 Equity is what we should be aiming for to create success! Rivers showed an image, that many people probably recognize, during her talk. It resonated with me and really shows the difference in these two types of strategies vs the reality of life. The world needs more women leaders - why not you? Being ahead in the world no longer starts with "who do you know" or "what do you know" but "who knows you". Networking and creating your own personal brand is a top priority. Making the best first impression possible, then leveraging that to build personal opportunities. Be true to yourself so you don't come off as disingenuous. Having a personal brand doesn't mean you need to have a second personality. Are you the same online as you are in person? Should you be? It's ok to start over. Think of "re-branding" yourself as a seasonal change, a metaphorical closet if you will. Take all your clothes out of the drawers and off the hangers and put them all on the floor. Wow -- big pile. Decide what you want to keep and what you don't need to keep. I love when a speaker starts their talk with a simple image and questions to the audience! It usually means there's a twist and a fun talk about to begin -- and that's just what we got from Nancy Douyon. What would you change about this haitian house? Answers rang out about electricity, paint jobs, siding, and the roof. For each answer Nancy gave a valid and thought-provoking reason why that wasn't necessary or good for the house in that part of the world. And this was just the beginning of a talk that made me realize everything I don't think about when I start to brainstorm solutions to a problem. Good solutions require insight and data into that problem. Nancy then went on to describe how the world is changing and how building and designing for that world requires a different way of things. We as engineers need to be building for a more inclusive world. One fabulous example she gave was changing stations only existing in womens restrooms. Who thought that women would be the only ones out and about needing to change a babys diaper? But then again -- why would it cross your mind as any other way? It's the way it's always been. We need to change our thoughts, test and design differently. As I've said in past articles, this conference only gets better year by year. They have an amazing group of women (and men) that take each attendees thoughts into account and put that into the following year's conference. The speakers always blow me away, but I was struck extra hard this year; these keynotes really hit it home. They all had something totally different to say but with one major thought -- build yourself up! Be the best you that you can be by getting to know yourself better. Make sure to also read part 2!